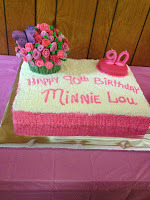 Yesterday I attended my Aunt Minnie Lou Hutchinson's 90th birthday party! She is an inspiring person with a reputation for good works for her family and her community. 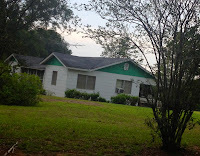 The birthday party was held at the Methodist Church in Tangipahoa, Louisiana where she has been a member for her entire adult life. The party was preceded in a church service where she was honored. She was one of seven children and sister to my mother. 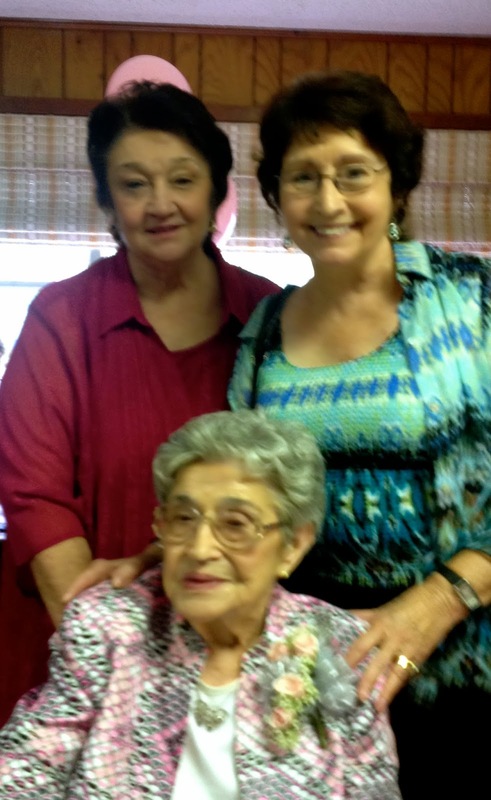 The sisters were close in age and in spirit throughout their lives and so my cousins were always close to me. Her birthday party was a grand affair. 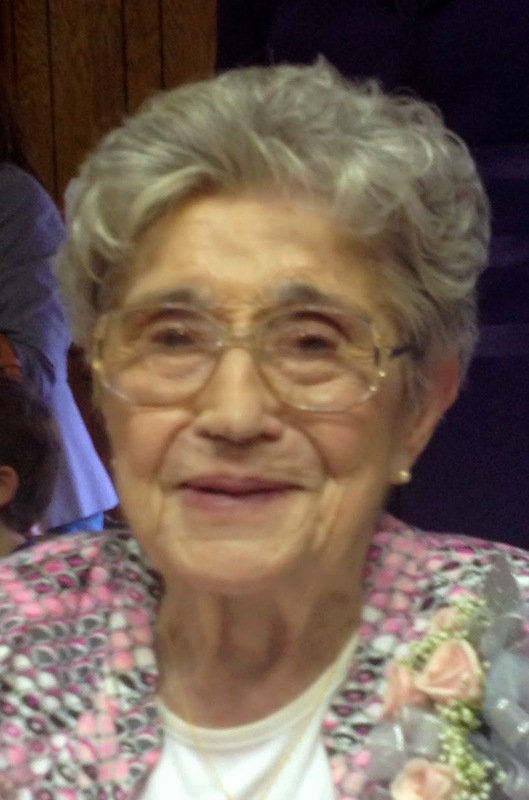 Almost all of her family members were there including children, grandchildren and great grandchildren. The room was also packed with friends and other relatives who came to wish her well. 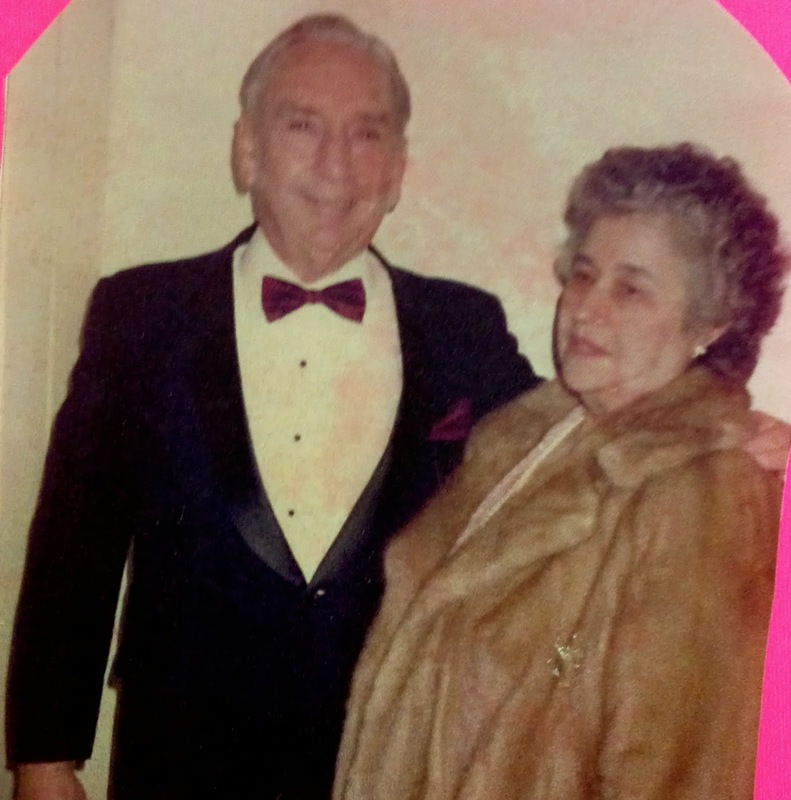 Aunt Minnie Lou and husband, Uncle Harvey were married 53 years when Harvey passed away in 1997. They had four children: Harvey, Wallace, Montie Sue and Nelwyn. She is the grandmother of nine and the great grandmother of twelve. Minnie Lou and Harvey were always quite the pair! She and Uncle Harvey were community and church leaders and active in Eastern Star and The Masons. She still belongs to the Daughters of the American Revolution and the United Daughters of the Confederacy. Her chapter of UDC was in part responsible for renovations and upkeep of Camp Moore, a Civil War site, that is now a national park and museum. Up until recently she was an officer in the group. Although she never said, I always felt that my Mom was secretly jealous of the beautiful evening gowns and active social life that her sister enjoyed. Their lives were not elaborate. They ran a dairy farm. Both would wake before dawn each day to milk the cows and then repeat the process at day's end. After the farm was sold, because of construction of Interstate 1-55 through the middle of their property, they settled into semi-retirement. Uncle Harvey had a desk job for a while. In 1964 she was hired as the Town Clerk for the newly incorporated Village of Tangipahoa and served in that capacity for over 43 years. As Town Clerk, she did everything from field complaints to managing water bills for the residents. When she retired most of the community showed up to pay honor this tireless community servant. A retirement dinner honored her as a person and as a dedicated employee. 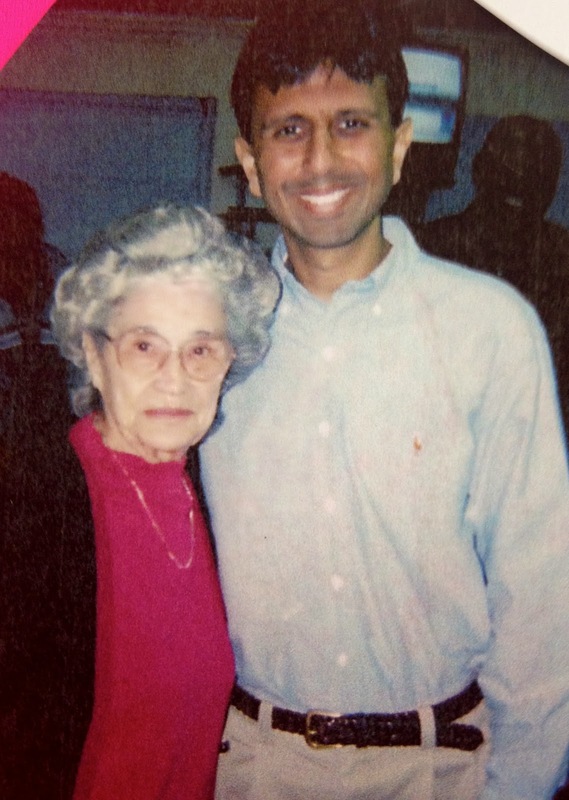 In her photo albums this picture of her with Governor Bobby Jindal was found. He joined the community in celebrating her work. Finding herself with spare time after retirement, she became a traveler and visited her sons who live in other states. She enjoys having an active part in their milestones of births, graduations and weddings. She is very proud of her family's many accomplishments. Aunt Minnie Lou now lives with one of her daughters. Age and some health problems have slowed her down a bit. She no longer lives in the lovely house the hill, which was a wonderful childhood memory for me. In my mind, this grand lady always took an interest in me and my family. I suppose many of us have or had an aunt like this. 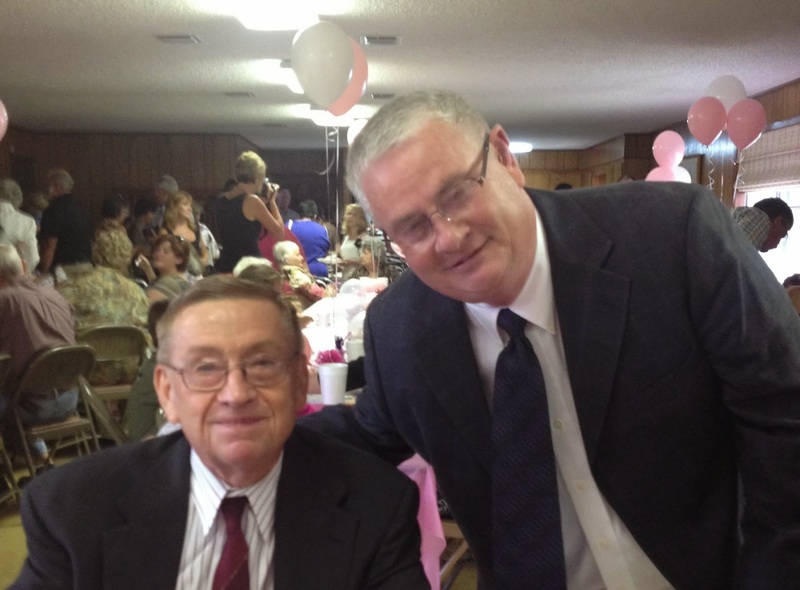 When I was a young bride she would call to chat with me and would always identify herself as "Aunt Minnie Lou from Tangipahoa." My husband asked me once: "How many Aunt Minnie Lou's do you have?" I looked forward to those calls and I know if I call her up right now she would want to talk about my family. Aunt Minnie Lou is like that. As a child, another good memory was her showing up at our house during the summer and telling me to "get your things because you are coming with me to Tangipahoa for a vacation." Fond memories were those! I remember the fresh milk straight from the barn on those summer mornings. I actually learned to drive there. My Uncle Harvey would put his auto, "Leaping Leena," in neutral and I got to steer as we coasted all the way down the hill and into town without changing gears. There were parties on the lawn which always included games and delicious cake. I believe I even got my first kiss at one of the later parties. I was never a great swimmer, but going to swim in the Amite River was also on the agenda. I still remember the "dinner on the ground" events at their church. If I were visiting on a Sunday, we would attend Sunday School and church services afterward. Sleeping "in" on Sunday was not tolerated. In the hot part of the day we would play endless games of Monopoly or just roam around the farm. Playing in the barn loft was a favorite way to pass the time. The cousins also had a playhouse and a small wading pool that Uncle Harvey had built. We could roam around all day in the safety of the clean country air. They were the first of those I knew who owned a hi-fi system and had a huge collection of 45's. Uncle Harvey would play the music and dance with us. Aunt Minnie Lou tolerated all the commotion from the kitchen as she prepared great meals of fresh vegetables on those summer evenings. Food conjures up memories and people and places for me. Aunt Minnie Lou took part in the publication of two cookbooks by the members of the United Daughters of the Confederacy. Here are two recipes. One is hers and the other recipe is found in the same cookbook. Mix sugar, shortening and eggs. Stir in other ingredients. Pour into a greased loaf pan and bake for 40 minutes at 350 degrees F. Cool in pan for a few minutes before cutting. 1. Combine lemon juice, sugar and bitters. 2. Add the balance of the liquids are stir. 3. Serve chilled or over ice. *I have always gotten a kick just out of reading this recipe. I have often thought it a misprint and that it was supposed to be a cup of each of the liquors.....Oh well....Sounds like a punch with a real punch. Very nice write up. She looks a lot like your mom in that top picture. I can see the resemblance. I enjoyed your walk down memory lane. Thanks, as always, for reading. 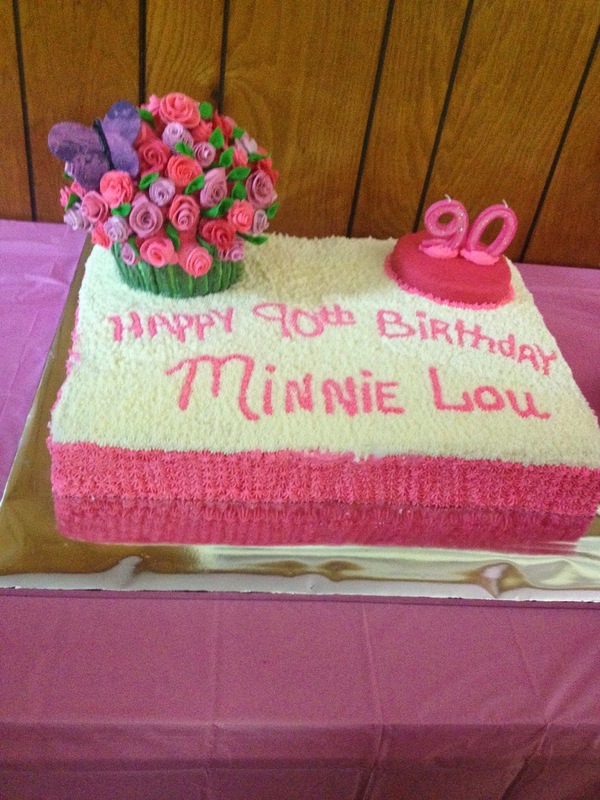 When I saw Aunt Minnie at her party on Sunday, I was struck by the resemblance and it brought a flood of emotions. Beautiful lady. Beautiful heart. Beautiful write up.